Who builds the best home theater in a box? 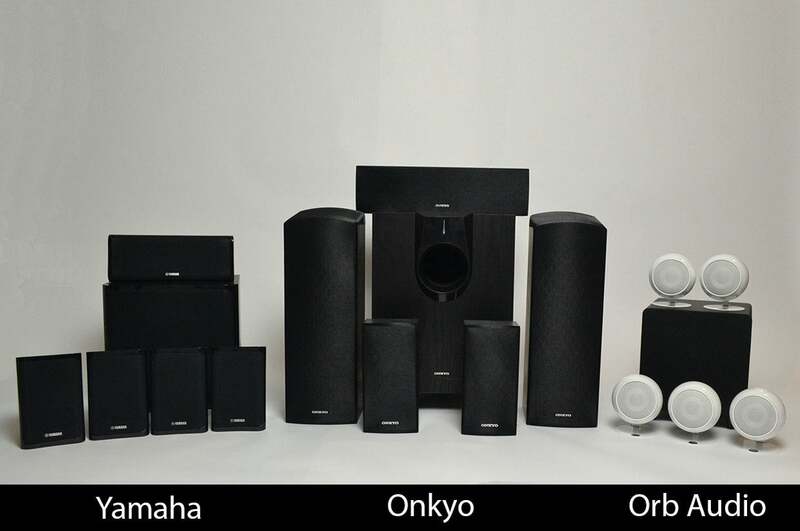 We review systems from Onkyo, Orb Audio, and Yamaha; one quickly rises to the top. Modern high-end TVs look beautiful and can deliver awesome picture quality despite their wafer-thin designs. What they can’t do is deliver audio performances to match. There’s just no getting around the laws of physics: The thinner TVs become, the less space is available in their chassis to house quality speakers. The result? Muddy dialog. You need to crank up the volume just to hear what’s being said. Bass? Are you kidding me! What bass? If you’re serious about getting the best experiences from TV shows, movies, and music videos, you need a dedicated audio system. If find the prospect of setting up a true surround-sound system with sonically matched components to be too daunting and expensive of a prospect, consider purchasing a home theater in a box (HTIB). What about sound bars, you ask? They are definitely another convenient solution; in fact, they’re even easier to set up (here’s our buyer’s guide to help you pick one out, if you want to go that route). But while most will deliver a better audio performance than a TV’s speakers, they just cannot take the place of discrete speakers for surround-sound effects. If you want the best surround-sound presentation on a budget, a HTIB is the better way to go. A home-theater-in-a-box systems will come with an A/V receiver, a least five satellite speakers, and a subwoofer. An HTIB contains everything you need for the audio element of a true home theater system. They typically include five speakers (right, left, and center speakers for the front of the room, left and right surround channels for the rear sides of the room, and a subwoofer for deep bass and low-frequency effects), precut cables, and an A/V receiver that ties the entire system together, much like the conductor in a symphony. We evaluated three HTIB systems, on its own merits. The one that’s exactly right for you will require you to balance your wants, needs, and must-haves. Since our primary consideration was performance in a home-theater setting, Onkyo’s $899 HT-S7700 is our top pick, because it’s the only one of the three systems to support the immersive audio technology Dolby Atmos. Dolby Atmos supports height as well as surround channels. 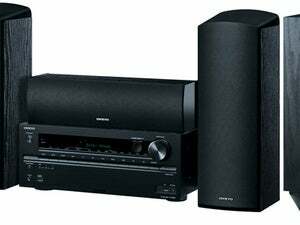 Onkyo also did the best job of balancing features and performance, and it was the easiest system to set up. Onkyo’s HT-S7700 HTIB was the only system in this roundup to feature Dolby Atmos Immersive Audio. Orb Audio’s $999 Complete Home Theater is our runner-up. If you want the system that delivers the best overall sound with the smallest physical footprint—and don’t mind giving up Dolby Atmos, networking, and built-in streaming services such as Spotify—this is the system to buy. 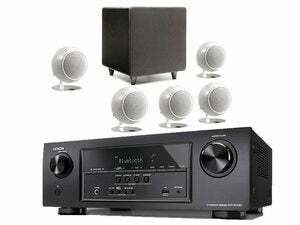 Yamaha’s $600 YHT-5920UBL is our third pick. It’s the least expensive of the three, and it’s the only one that’s capable of delivering genuine multi-room audio right out of the box, thanks to its support for both Yamaha’s own MusicCast technology and Apple’s AirPlay. The downside, in our book, was the quality of its sound from its plastic speakers. Use the arrows at the bottom of the page to work your way through all three reviews in order, or click the product names below if you’re only interested in reading specific reviews. 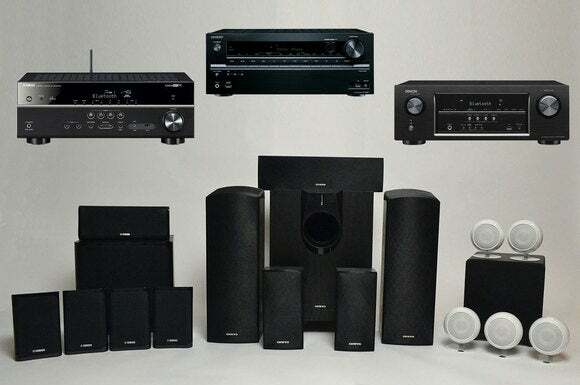 For details about how each system was tested, and a guide to the features you should look for when shopping for a home theater in a box, read on. Each of the three HTIB systems evaluated here was tested in the same 24-foot-long by 13-foot-wide home theater. In my first listening sessions, I set up each system in the appropriate locations in the room: The front right and left speakers were placed on either side of my TV, elevated by 24-inch stands, and the center speaker was placed below the TV. I placed the surround speakers about two feet behind my listening position. I used the cables provided with each system to connect the speakers to the A/V receiver. I then calibrated each system using its built-in room-correction software. I used 5.1-channel mode (or Dolby Atmos mode, where appropriate) to evaluate performances with movies, and 2.1-channel mode to evaluate performances with stereophonic music. All other onboard DSP (digital signal processing) modes were disabled. For my second round of listening tests, I set up all three systems with the speakers placed as close together as I could (in the same locations in which they were tested in the first round), and I level-matched each to the other before performing A/B/C listening tests. I used the Pink Noise track from Revel’s LFO-optimizer CD to set the volume of each system at 75dB for reference-level listening. 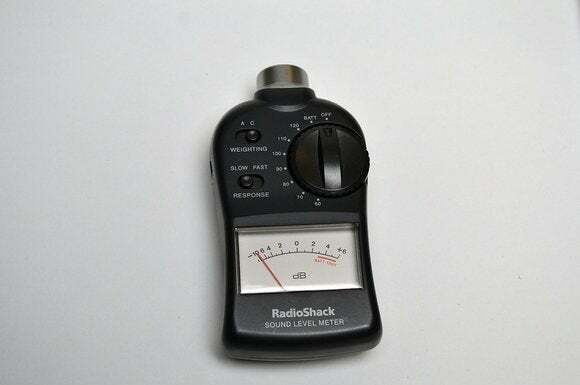 I used a Radio Shack analog SPL meter for those measurements. If you don’t level-match the equipment you’re evaluating, you can wrongly perceive something that’s just louder as sounding better. Each system was level-matched using an SPL meter. I played the same demo material on all three systems: AAC-encoded files for music (the soundtrack from Star Wars: The Force Awakens, and Loreena McKennitt’s live album, From Istanbul to Athens). I evaluated home-theater performance using movies on Blu-ray discs, including Mad Max: Fury Road. The feature sets in audio systems are typically driven by price: The bigger your budget, the more features you’ll find. That’s not the case with these home-theater-in-a-box systems. The least-expensive product—Yamaha’s $600 YHT-5920UBL—has multi-room capabilities that the two pricier systems don’t deliver. And the most-expensive system—Orb Audio’s $999 Complete Home Theater—can’t connect to a home network. Here’s an alphabetical list of the most important specs and features to look for when you go shopping for your system. Amplifier power This spec can provide some guidance as to how capable the system will be of filling your room with sound. Basically, the bigger the room, the more amplifier power you’ll need. The spec you should care about will be expressed in watts per channel, e.g., “115 watts per channel x 7 channels.” Don’t get too hung up over this spec, it’s probably one of the least important things you’ll need to consider. Audio return channel (ARC) An HDMI feature that sends audio from your TV to your A/V receiver or sound bar. It's most useful in scenarios where your TV is creating the audio; for instance, if you're using the TV's tuner to watch over-the-air broadcasts or a smart TV to listen to streaming music over the Internet. Another reason we chose the Onkyo as our top pick: Its receiver was the only one to have two HDMI outputs, which means it can support both a TV and a video projector. Component video inputs/outputs Component video splits analog video into three component signals. You won’t need these connections unless you need to hook up an older TV, DVD player, other device to your system. Composite video inputs/outputs Composite encodes video into a single signal. Here again, you won’t need them unless you want to connect older hardware to your system. DAC (digital-to-analog converter) Your receiver must have a DAC to convert digital audio signals to analog signals that can be amplified and sent to your speakers. Two specs measure a DAC’s capabilities: Resolution (expressed in bits) and sampling rate (expressed in thousands of cycles per second, notated as kHz). A 24/192 DAC is capable of decoding a digital signal encoded with up to 24 bits of resolution at a maximum sampling rate of 192kHz. These specs measure conversion capability, not necessarily the quality of the resulting conversion. Digital audio inputs/outputs As an input, this connection lets you connect the output of various digital-audio devices, such as an outboard (and presumably higher-quality) DAC, to your system. As an output, this connection lets you route a digital audio signal from the receiver to outboard equipment, such as a DAC (see above). Front-panel inputs/outputs You’ll find the vast majority of an A/V receiver’s I/O ports on its rear panel, because you don’t want to see all that cable spaghetti on a daily basis. But you’ll appreciate having some inputs and outputs on the front panel for making temporary connections. You’ll want a headphone output at minimum. Having a USB port is convenient for making a hardwired connection to your smartphone or digital media player. And an HDMI input is extremely handy for connecting a digital camera or a laptop so you can display its output on the larger screen of your TV or video projector. Front-mounted input/output ports can be very handy. 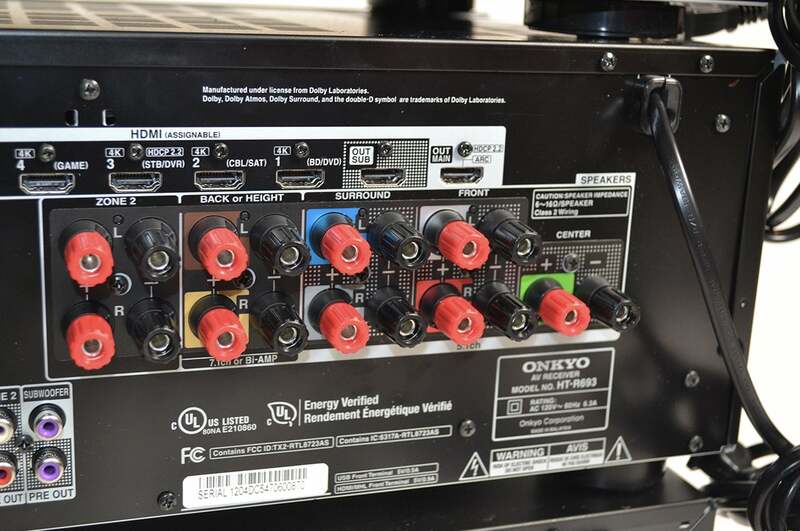 I've circled the HDMI and USB ports are circled on this Onkyo HT-R693 A/V receiver, which is part of the Onkyo HT-S7700 HTIB. HDCP The acronym stands for High-Definition Copy Protection, and the most recent version is HDCP 2.2. You’ll need HDMI inputs and outputs with HDCP 2.2 to play back protected 4K UHD content from Ultra HD 4K Blu-ray discs. At this writing, less-expensive A/V receivers typically have only one such input and output. HDMI inputs/outputs HDMI carries both digital audio and digital video signals on the same cable. The most recent version, which supports both 4K UHD resolution and high dynamic range (HDR) is HDMI 2.0a. The number of inputs you’ll need depends on how many outboard devices you need to connect: A cable or satellite set-top box, a Roku or other media-streaming box, a Blu-ray player, a home-theater PC, a videogame console, and so on. The number of outputs you’ll need depends on how many displays you want to connect. If you have both a TV and a video projector, for instance, you’ll want a system with at least two HDMI outputs. Note that those displays also must support HDMI 2.0 and HDCP 2.2 in order to display copy-protected 4K UHD content. Height channels Movie soundtracks encoded with Dolby Atmos and/or DTS:X treat audio events as objects that can be placed in three-dimensional space. They go beyond front left, right, and center; surround; and rear surround to take height into account. This is ideally accomplished by installing speakers in the ceiling at both the front and back of the room, but it can also be done with conventional cabinet speakers that have special drivers that bounce sound off the ceiling. This story provides an in-depth explanation of this concept. Movie-soundtrack processing Most movie soundtracks are encoded for surround sound using some variation of the Dolby or DTS codecs. Dolby Digital and DTS are part of the DVD standard, and the higher-resolution Dolby TrueHD and DTS-HD Master Audio are part of the Blu-ray standard. Dolby Atmos and DTS:X, described above, add the element of height. Multi-room audio A multi-room audio system can play the same or different songs on speakers in different rooms inside your home, managed by a centralized controller (most commonly an app on your smartphone or tablet). 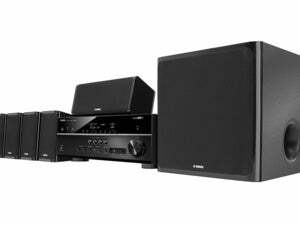 Sonos is arguably the most popular multi-room audio system, but Yamaha (MusicCast), DTS (Play-Fi), and others have also introduced systems. 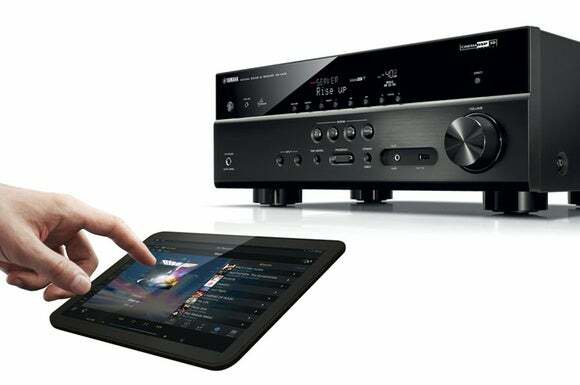 Yamaha’s YHT-5920UBL HTIB features MusicCast, a multi-room audio-streaming technology. Multi-zone support Support for multiple zones—essentially being able to pipe media to other rooms—was much more important before multi-room audio became so affordable. The room in which the A/V receiver is located is considered Zone 1, a second room would be Zone 2, and so on. A receiver might have Zone 2 (or Zone 3, Zone 4, etc.) speaker terminals that enable the receiver’s amplifier to drive speakers in a second room, or it might have line-level outputs that can send audio and/or video signals to an amplifier or TV in another room. The value of both types of zone support is limited unless there’s also a provision to install a control mechanism—such as an infrared receiver—in those other zones that can carry command signals back to the receiver (to control volume, at a minimum). Network support You’ll need to be able to connect your A/V receiver to your home network if you want to stream music from a computer or network-attached storage device (aka a NAS box) on that network, or over the Internet using services such as Spotify. An RJ-45 ethernet connector provides the best connection, but an integrated Wi-Fi adapter is considerably easier to use. Room-correction tools No room in the typical home will exhibit ideal acoustics. Door and window openings, unequal wall lengths, variations in width, uneven ceiling heights, and other features can wreak havoc on the soundwaves coming out of your speakers. Room-correction hardware and software can mitigate these issues, typically by analyzing the room with test tones and a microphone and making adjustments with an onboard DSP (digital signal processor). They can’t do miracles, but they can make a bad situation better. If you want to play media files stored on a USB storage device—or on a digital media player or your smartphone—you’ll need a USB port to stream those files to your A/V receiver. Having a USB port on the front panel is obviously more convenient than having to reach around to the back. This budget-priced home theater in a box delivers incredibly rich streaming features, but only mediocre sound. You’ll be hard-pressed to find a better-sounding or more decor-friendly HTIB for less than $1000. This high-value, high-performance system takes movie night to a whole new level of awesome.